Two months after Dunkin’ Donuts launched a catering test in four states, McDonald’s is following suit with a similar program in Central Florida. But, don’t expect bundled Big Macs at the office. Instead, McDonald’s is testing breakfast catering in 195 restaurants in the Orlando area. The bundled morning meals include more than a dozen pre-selected catering trays serving everything from Egg McMuffins to pancakes to parfaits. Diners can also craft their own breakfast bundles. Catering is only available during breakfast hours. The packages, available for delivery through UberEats or for pickup, target groups of 6, 12 or 18 and larger. McDonald’s did not provide prices for each bundle. “Prices are determined at the individual restaurant level and may vary,” the company said. According to a restaurant along Orange Blossom Trail in Orlando, a breakfast meal of 3 Egg McMuffins; 3 Sausage, Egg & Cheese McGriddles; 3 hash browns; and 3 Fruit ‘N Yogurt Parfaits was priced at $25.75. A larger catering tray for a party of 12 dubbed “Early Fiesta” cost $38.85. It includes 12 sausage burritos, 6 parfaits, 6 Fruit & Maple Oatmeals, and 6 Baked Apples Pies. 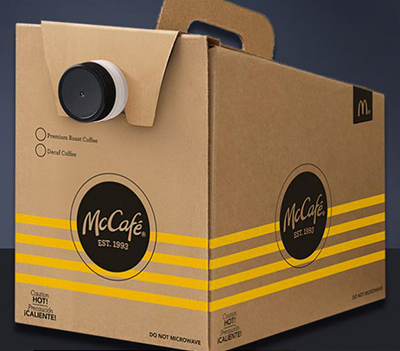 McCafe coffee, orange juice, Southern Style Sweet Tea or unsweetened iced tea can also be added to orders for an additional cost, the company said. Customers in Central Florida who want to avoid delivery fees can call ahead and pick up their orders. McDonald’s has created a dedicated phone line for pick-up catering orders. A spokeswoman for McDonald’s said the Orlando catering program is only a test. The chain has not made any decisions on expanding the program beyond the pilot at 195 Orlando area restaurants. The Florida experiment comes as fast-food chains are focusing more on off-premise sales. In March, Canton, Mass.-based Dunkin’ Donuts began offering catering in 16 locations in Massachusetts, Vermont, Pennsylvania and Connecticut. The bundled Dunkin’ Donuts packages, geared for parties of 10 or 20, range in price from $30 to $96. Plates, silverware and an exclusive “DD” branded tablecloth come with each catering order. Orders must be placed by 1 p.m. the previous day for next-day pickup. McDonald’s, on the other hand, said phone-in orders can be made with at least one hour advanced notice, according the company’s catering menu. McDonald’s, which is relocating its headquarters to Chicago in early June, has more than 37,000 restaurants worldwide.